The VL Destino debuted earlier this year at the 2013 North American International Auto Show with the help of former General Motors chief Bob Lutz. 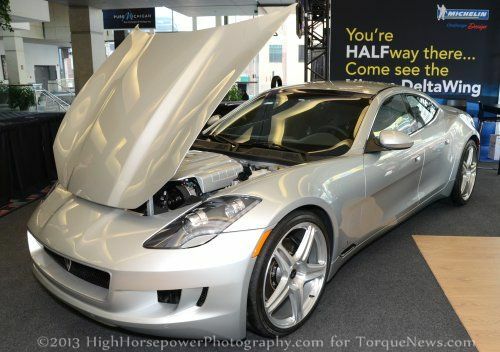 The Destino featured the interior and exterior design of the Fisker Karma extended range electric vehicle but in place of the electric drivetrain and range extended turbocharged 4-cylinder, the sleek sport sedan packed the 638 horsepower V8 from the Corvette ZR1. However, as Fisker has quickly traversed the slippery slope of corporate death over the past few weeks, it left many questions about the future of the high performance Destino. Fortunately, Bob Lutz claims that Fisker’s demise won’t have any impact on the VL Destino. Click here for a closer look at the features of the VL Destino. VL originally purchased 20 “glider” units of the Fisker Karma to kick start this project but the company has reportedly received around 100 orders for the high performance Destino sedan with a significant level of interest coming from the Middle East. It is unclear right now where the rest of those vehicles will come from to fulfill those orders but Lutz told Ward’s Auto that if Fisker dies altogether, VL will approach the suppliers on their own. There is the possibility that is Fisker Automotive goes out of business, they assets will be liquidated and among those assets could be the items needed to build more VL Destino sedans. There is also the possibility that VL could purchase any available Fisker Karma units intended for sale and then rip out the EV guys on their own. While this is a costly way to go about acquiring shell vehicles on which to base the Destino, if Fisker goes out of business the value of the for-sale Karmas will likely go down quite a bit. The production VL Destino is expected to carry a price tag in area of $185,000. In addition to those orders, VL has heard with “hundreds” of Fisker Karma owners who are interested in the V8 conversion. Lutz indicates that only around 10% of those folks may opt for the conversion that is expected to cost somewhere in the area of $85,000-90,000. Lutz stated that these owners are looking to get rid of the extended range electric drivetrain because in the future, their Karma sedans could end up as “boat anchors”. That might seem awfully harsh but if you have never tried buying parts to repair a vehicle from an out of business automaker, it can be a real nightmare. The fact that the Fisker Karma is so unique will almost certainly make finding parts near impossible if the company completely dies – and that is (sadly) a very real possibility at this point. When the VL Destino debuted at the 2013 North American International Auto Show in Detroit, it was powered by the 638 horsepower supercharged LS9 V8 borrowed from the Chevrolet Corvette ZR1. The company explained that they intended to use the ZR1 drivetrain which comes only with a 6-speed manual transmission in addition to the new LT1 V8 from the Chevrolet Corvette as a base engine option, with either a manual or automatic transmission. However, the report from Ward’s Auto states that the early VL Destino will be powered by the supercharged 6.2L LSA from the Cadillac CTS-V. While the blown Caddy V8 packs a little less power than the Corvette’s LS9, the 556 horsepower mill from the CTS-V already has an available 6-speed automatic transmission and VL is finding a great deal of interest in automatic transmissions. VL still expects to use the 628 horsepower LS9 at some point but the 556 horsepower LSA will provide an immediate option for those who want an automatic transmission in their Destino. The VL Destino is expected to officially hit the market during the third quarter of 2013, once the company has had a chance to meet all of the various government regulations including safety and emission requirements.